It was just the latest act in what had been a long running battle in my call centre – A fierce fight over the very right to answer the call of nature. Previous to the sticky-taped missive a number of memos prohibiting the use of the toilet in work time ‘unless an emergency’ had been issued, and subsequently ignored, amid much canteen and car-park whispering of ‘how dare they.’ Even those among us who would usually be the most docile and compliant members of pro-management staff were up-in-arms. We were unanimously agreed; the right to go when we needed to go was an inalienable one which we would not give up easily. Imagine being 31 (and a 1/2) years old and being told you’re not allowed to vist the loo. Immature it may be, but I did infact give my “team leader” the extended middle finger after being told this. Who the hell does she think she is?! This is just call centre life unfortunately. We have to be available at all times other than scheduled breaks, needing to pee is apparently unimportant. And they are right. The toilet issue is not exclusive to the call centre. Check-out assistants and workers in some other industries also have a tough time, but the call-centre has been fairly notorious for waging war on the toilet break with some gusto, in cases going to extreme lengths in finding strategies to control their staff’s use of the toilet. The main tool in the battle seems to be monitoring the time taken by staff in the toilet. In my call centre the layout was such that our manager would know instantly how long you were away from your desk and you’d very much feel that the clock was ticking. As far as I know however, no times were ever logged; Alan Carr on the other hand describes a ‘log book’ in the Barclaycard call centre where employees were instructed to record the time taken using the toilet complete with a set of guidelines – 5 mins allowed for a number two and 3 mins for a simple wee. Another call centre in my town – belonging to a major utility – had more sophisticated systems which electronically logged time away from a work-station to go to the toilet, but as far as I’m aware even this system didn’t trigger an alarm with flashing lights, as is the case of the Norweigan call centre , belonging to DNB an insurance company, where managers received a notification alarm if a member of staff spent more than an allotted eight minutes a day away from their desks. Whilst I myself never got more than a withering stare for abandoning my headset to rush to the toilet, others were asked to produce GP’s notes to account for the time they spent on the toilet. Its also not unheard of for workers to be pulled up on time taken in the loo; In one extreme case which was reported in the national news call centre managers were even threatening workers who spent too long on the toilet with being forced to wear a disposable nappy. So just why does the call-centre have such a problem with the call of nature? The key reason, unsurprisingly, is that it’s all about the money. In one of her many memos on the subject our manager, Peggy, lays bare her reasoning for the war on the loo break..
Every time some one leaves their desk we lose a call, whether it’s for a query, loo break or to get water. This, over a week can equate to in excess of 2000 calls lost, with a loss of revenue which we cannot afford in this difficult economic climate. Fuzzy math aside (2000 calls at an average of 3.5 minutes per call – means collectively we’d be spending just shy of 120 hours a week on the loo) it speaks volumes about the priorities of the call centre. Sat at their desks call centre workers are like a part of a machine. Like a piston in a machine whose movement generates money there is a loss of revenue each time the piston, and the machine stops. Call centre managers main concern is to keep the machine running and therefore there priority is to keep workers at their desks for as long as possible. Viewing workers as part of a machine dehumanises them, to the point at which bodily functions are denied, or viewed as a threat to the machine and which must therefore be the subject of control. There is also a need for a specific legal right to use toilets in the employer’s time without a deduction in pay, and without any harassment. In the meantime the battle will rage on in call-centres up and down the land. I’m sorry but this is really quite hilarious. On the other hand, it’s totally sad that employees can be discouraged (or even stopped) from going to the toilet. I knew there were issues at your call centre where you had to get your coffee before you shift (and then not get a new one during the shift) but not being allowed to go to the loo is just terrible! It really is terrible! Thankfully my place, while I was there at least, wasn’t the worst offender – that honour went to the nearby ‘major utility’ call centre where they really were hot on toilet break times. It seems to be an issue in industries where the individual is not seen as a person but a cog in a machine – a machine which must be kept working at all costs. I remember the coffee thing well, so glad now that I can once again get a coffee when I want it, though this does leave me overloading on caffeine! Wow, how horrible. People are being enslaved in every possible way. Yikes! Now that is scary…. I once worked at a place and we would say that work was just training for never getting up to pee on 9-10 hour transcontinental flights. Not sure if it’s healthy, but we got really good at holding it. This is hilarious and to call center employees everywhere … go at your desk. Piss on the computer, into your trash can, on your boss, but do take that next call and the next one and the next one until your shift ends. And if you are on a call when your shift ends, stay on that call until completion. It is hilarious, hearing call center employees whine while call centers make customers wait on hold. Those customers fear that if they go take a piss, that the call center employee will somehow know this and finally answer the customer call. 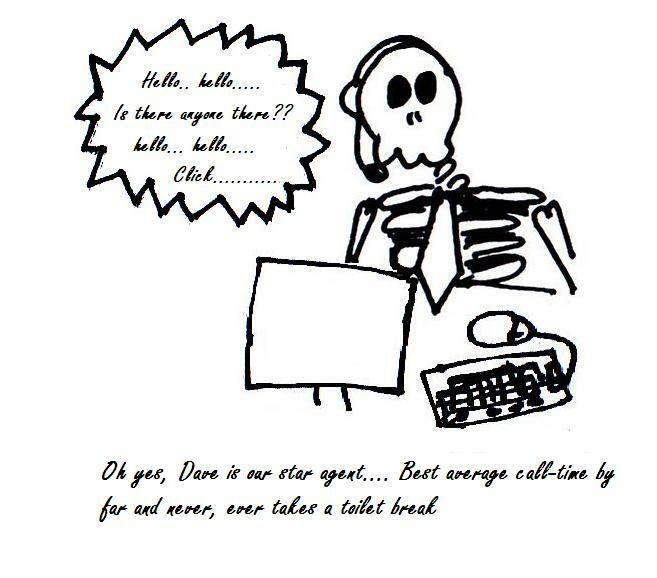 When the call center finds no one on the other end, they hang up, leaving the customer in a lurch, requiring that the customer go through the “we care about you” (but not really) message.while waiting countless minutes and hours on hold, again. When I worked at a call center, it seemed like the allotted breaks were never long enough. I work in a call center. It is a small one in a national (we have a small amount of international claims) commercial claims department. When we leave our desk, we have to select a reason when we put our phone into not ready. So it knows when we visit the toilet. And how long we are gone, assuming we don’t forget to put ourselves back into ready. Even so, we are not yelled at for excessive use of the toilet. There are times when people have to go more often or occassionally find that the toilet takes a lot longer than normal. It is life. Everytime I hear these rules being implimented in companies in other countries, I think that one solution is for people to start wizzing themselvesat work and say that they couldn’t help it. They had to go but were not allowed. This is hilariously bad! I think though, that as the world gets more and more connected and stories like this are heard by more people, employers won’t be able to get away with this kind of stuff as often. They’ll start learning that they can’t treat their workers like cogs in a machine! I worked for a Satellite TV call center for a year and so this made me laugh HaRD. I don’t work in a call center, but I did work in a health care facility. We were tracked (and paid) based on our productivity. We were expected to log treatment minutes for 55 out of every 60 minutes. While bathroom breaks were not forbidden, it is pretty impossible just to transport patients, write paperwork, enter billing, and handle normal family and staff interactions in those ” free” 5 minutes per hour. Forget it if a patient wasn’t exactly ready, or a wheelchair needed repair. Sadly, UTIs became accepted as a job-related hazard. And this was in a health care facility…I can’t imagine how dehumanizing work would be in a call center, where clients and staff never meet. Not only is it legally questionable, it’s unhealthy and in humane. This is unbelievable! Makes me thankful that I have quite possibly the easiest job in the world. It’s good that you blog about it though, must be very cathartic. I look forward to reading more! Thanks for posting this. Although we can laugh at the ridiculous policy, it also says something deeply sad about how some workplaces are structured and managed. A reminder of how badly workers can be treated (even if it’s a semi-humorous reminder) is always important. Mwaha, it’s true all around. May make my job more tolerable, this. I worked in a call centre for years, for my sins no doubt. They are indeed the most inhumane places, where one can’t help feeling like a battery chicken. And they seem to promote the most stupid people as policy! Love this blog. Awesome picture! This describes the call center I worked in to a T! Great way to encourage employees….. It amazes me that employers get rowdy over what is normally less than a couple minutes away from the workstation. I love this post! I’ve been there… and I feel your pain. Oh, so true. I’ve worked in a couple of call-centers, the latest one being a New York State run one. While not coming right our and saying it, mine took a passive-aggressive approach to limiting our toilet time. All of our calls and computer times were logged and when tied to a phone, the company new exactly how long we were away; Our constant write ups were for a total log out time, which could only be explained by bathroom breaks. I was told repeatedly to get my times down and as a woman who has had 6 babies, I can tell you that just didn’t happen. I took the write ups as apposed to having to change my clothes! But because they never came out and forbid the bathroom, just harped on our time away, the harassment was allowed. I am so glad I changed my career to nursing, now I can squeeze in a pee while my patient is doing the same! Great post, congrats on FP! Hi, I love tins post, so funny but the sad thing is it’s truth. I think most managers would like to ban their employees from going to the loo in “work” time. In my job, we are not allowed to be seen by the clients to be drinking anything., very difficult in hot weather and the nature of the work means we often are not able to take a break. Somebody has deemed it “unprofessional” Who comes up with these rules? This means we don’t drink so we spend less time going to the loo as well! Brilliiant! Great blog. The call centre I worked at did ‘allow’ loo breaks but if an analyst spent too long on a loo break, I would get called to find out ‘why’s your analyst still on a loo break? is there something wrong?” We weren’t in the same room or even the same country as the overall call centre manager hence the phone calls instant messages to me. When I was young I really wanted to work in a call centre (don’t know why, just thought it would be a cool job), needless to say, I don’t want to work in a call centre anymore. I feel your pain anyway! Good luck! Oh my goodness. I’ve been an office temp before, and timed in the bathroom. Being just a cog in the wheel of a business is awful. When businesses view employees as assets, the businesses run better because employees are emotionally vested in its success. If only they realized it. I can usually see the humor in everything, but this is just evil. I worked on an assembly line for a few months where it was like that. Never again; I would become a criminal or a beggar first. As a middle-aged person whose body tells him when it’s “time”, I would just tell anyone who tried to “schedule” me what they could do about it. I’m glad for you that you are not there any more. Lots of interesting comments – I don’t restrict my employees from loo breaks, but I’m sure employers would appreciate it if their employees went before their shift and during breaks (emergency visits excluded of course). This is all part of preparing oneself for the workday ahead – it shouldn’t be about “not allowed to take loo breaks”, but the real necessity of a loo break compared to just slacking off for a quick break at the employer’s expense. Trust me, everyone *does* go before work starts. Some ppl just have to go more often than others. And honestly, if my employer gave me guff about it I’d be leaving it in a cup on their desk. that’s a load of BS. My break was to get away from the stress of being on the phones. You can deal with having humans on phones by understanding that bladders don’t have a schedule. Have entirely automated systems if you’d like and just see your customers complain. It’s all about greed and power, isn’t it? One can read Dickens, and see what happens when greed and power arrive at a perfect storm in which the employee is powerless, for now. In your case, your employer has the ability to follow your work data in excruciating detail, and the power and cold ruthlessness to turn the screws accordingly. Human nature is universal: you could be slave workers from millenia ago, bemoaing yout lot. Until you seek and find power sufficient to effect positve change for yourself, your situation is quite hopeless: quit or deal in that case. From my position of safety, I’d suggest gathering some power, which making this situation public beings to achieve. Fight the power if you dare: they have no moral claim, clearly. Is such work so precious to you as to preclude any risk of losing it? “Should” is nice but generally accomplishes very little on the ground: only raw power speaks to bullies anywhere. Good luck. This is horrible but sadly true for any industry where intensity of human efforts is high. Fortunately CSR advocates are keeping an eye on this. This is an example of someone who ruins things for everyone else. You know there was some slacker who was goofing off that said he or she was going to the bathroom. I think going to the bathroom during your break is reasonable. I think that’s what breaks are for. Emergencies not withstanding… but come on…we’re all adults here, right? We should be able to control our bodily functions a bit. Working as a public high school teacher, I had a very regular bathroom schedule. I couldn’t run out of the classroom in the middle of a lesson, and had to utilize the small passing periods as needed. I really appreciate my current job which permits potty breaks any time. Amazing that employers think that while they’re paying you, they own you. Can you imagine if a manager had to log-in their potty time? It’s just ridiculous. Even ‘machines’ need maintenance and cleaning, right? Aren’t happy, comfortable employees more productive, loyal employees? This is really frustrating!Not being able to go to the toilet when you feel like it because some company will not get as much money as possible!Seriously? How terrible! No wonder call centres have such high turnovers. They should have started making more humane systems instead of this eons ago so that more people will like working as a call centre agent. Kudos on you for posting this and here’s hoping for better working conditions sooner not later. As disgusting as it is, perhaps workers need to stage a toilet style sit-in. Show their employers just how messy, smelly and unpleasant their office life will get if you don’t let people use the loo. If an employer told me that I couldn’t go to the bathroom, I’d quit. Simple as that. This is ridiculous! More and more some industries are trying to turn people into machines. What next, will they be giving their robots, uh I mean employees, urine bags, or anti diuretic pills to improve efficiency, so no one has any reason to go to the bathroom ever? Or how about feeding tubes like they give to hospital patients, so that they don’t have to take meal breaks? And IV bags to prevent dehydration? Or powerful amphetamines(caffeine is for losers!) so they can stay awake all night? Call centres are evil for everyone involved. How depressing. The arseholes up top who make these decisions should try living 1 week in the life of their employees. How they havent been hunted down and beaten to death in the streets in a mystery. Wow! Who would have a thought a day would come when loo break had to asked as a basic human right. I’d just pee myself at work and that would take care of the problem! Is it wrong that you just turned me on? No I am very proud. I worked in a call centre for a year as a stop gap. It was the worst job I ever had. We were allowed 2 mins max to go to the toilet. Rediculous. Hilarious and sad at the same time. It is just ridiculous to restrict loo breaks. Have a revolution- pee jars in every desk! This would really affect my ability to be polite over the phone! OMG! How can they “lose a call whenever someone goes? !” Aren’t the calls distributed randomly to whomever is available (as long as too many ppl don’t go at once)? Aren’t callers put on hold “until the next available representative”? its sad though absolutely hilarious….’you cant pee now’…OMG…. hope you get a way out soon!!! good luck! Fight the power! Don’t let them take your pee-rights away!!!! Even school-kids get the whole “one at a time” rule. If teenagers can manage it, surely adults can be trusted to, as well. Present the company with the doctor’s bill for treatment of a bladder infection. will probably be more than the cost of those 2000 missed calls. Great post! I worked in a call centre for four years while studying at uni. I’ve never been treated like such a child. Even in my primary school you were given more respect! The “toilet break lengths” were always under scrutiny by team leaders/management. The phones would log how long you were away from your desk for a particular reason “tea break,” “toilet break” etc. I was once given an earful for being 30 seconds late from my lunch break. It’s a shame really, the dehumanization of it all. Doesn’t look like things will change anytime soon. Funny, but a bit scary to think that employers can get away with treating people that way. I worked in a call center for a major health insurance company. These twits thought we could answer all calls in 30 seconds or less. People who call into call centers, please know that those you talk to aren’t responsible for the stupidity that goes on. It’s the suits in the offices who only see money, not humans. I advise you to contact those organizations that you call frequently and tell them to cease measuring their stats by call time. You’ll be happier and so will the folks on the other end of the call. I worked for directory assistance (the guys you call for a phone number). We had to keep our average call time under 24 seconds. All day long every day we had to average less than 24 seconds. It doesn’t matter if the person calling in has no clue what they want or where it is. Like you said, it is all about money and they don’t care about anything else. Very funny! I remember when I worked in a few TV stations it was always very busy and the poor receptionist was always calling around trying to beg someone, anyone who was available to sit at the desk and answer the phone while she ran to the loo. Poor thing. I don’t work in a call centre, and we’ve had so many other “perks” taken away that I wouldn’t be surprised that if next we do have to ask our team leader if we can go to the toilet. How long will it be then that they start listing toilet breaks on the list of benefits along with pension and 25 days holiday?! Everyone is different, I do tend to go to the loo more often. No job is worth sacrificing your dignity, I think if my employer suggested I wore a disposable nappy I’d tell them where to shove it. Haha! I feel your frustration. I had a douchebag supervisor who, to discourage you from going to the loo during a shift, would loudly exclaim: “you’ve been aaages, what were you doing, a massive dump or something?” he did this every time. EVERY TIME! Goddamn him, it’s been years but i’m still mad at him!! Reblogged this on Burite said so. . Enjoyed the article, but omgoodness… would the call centres rather than employees urinate in their chairs? I’m venturing to guess the call centres would not like it. They say use for emergencies, but when one has to go, one has to go. I don’t know if they would care. Customers don’t go to the call center so the customers wouldn’t notice the smell. And the chair wouldn’t be functionally ruined so they could just force another employee to use the chair after your shift. If it doesn’t impact profits call centers tend not to notice. That is totally absurd. Though call center is known for an unhealthy lifestyle, I never knew the toilet issue until I read your post. Health is very important why we function well. Therefore, employees should be given a fair and right consideration to have bathroom breaks. This was very insightful read. Very well deserved to be on Freshly Press! I worked at Bernard Matthews once (very briefly!) and they actually give toilet breaks to workers regularly so that their workers cannot go and skive in them! These are on top of the tea breaks too so it breaks the boring monotonous work up. I have heard of employers doing this to their employers but touch wood (or is that touching cloth!?) I have never had anyone stop me from a call of nature, to do so definitely takes our human-ness away in my opinion. Do the managers get stoppe from going? At the call center I worked for years ago we had a statistic called “Adherence”. Every second we were no logged on when we should have been and every second we were logged on when we should not have been counted against adherence. If it got bellow 99% your manager would talk to you. So they literally counted if I logged off my computer 5 seconds after my break started or ended. It was ridiculous in that manner, though they did allow you to go to the bathroom. Unfortunately it was up to you to figure out if they would bring your adherence bellow 99%. But the worst was not at a call center. I use to do suicide watches at hospitals and when doing a suicide watch somebody has to be within arm’s reach of the patient at all times for patient safety. So if I need a bathroom break I needed a nurse to cover me for it. Sometimes that went well when the nurse liked me or wasn’t too busy. But other times I had to sit there for an hour, two or more wishing I could go to the bathroom. At a certain point I would start eyeballing the bed pan or hand urinal wondering if I could manage it. I never did but sometimes I was desperate to relieve myself. I work in a call centre. We’re allowed 15 minutes a day personal time for toilet or drinks. If I need the loo I go. If I need a drink I get one. Health and safety. It’s dangerous to keep waste water/solids in your system. It can lead to several nasty illnesses including various cancers. In a call centre you are on the phone constantly so you need to keep your throat lubricated. Again health and safety. You need a union. They would make short work of the idiots. You should stand up to them. They don’t have a leg to stand on. Haha! Sorry to mock your pain, but this post cracked me up! I worked in the same call center three different times – stormed out yelling at everyone there, twice. I hated that job! I also worked from home as a psychic hotline operator. Same pay. All the bathroom breaks I wanted. Tee hee. As for me, if I have to pee, I cannot make good decisions. If I were working in a call center and in pain from holding it in, I would be making mistakes in my work! They would beg me to go to the “loo”. I have a friend who works at a call centre, and he has irritable bowel syndrome (IBS) so he has to run to the bathroom often. His new boss flipped out and made him get a doctors note so he could go… do his business! I know exactly how it feels to work in a callcentre after having worked for Excell Multimedia many years ago. I even wrote a fictional account which won a competition. It’s the last story in my collections of short stories I’ve got out on Amazon. The company cut our bonuses ans didn’t even pay sickness pay, despite my not having had a day off sick for seven years. Oh,we formed a union and forced them out. Another company took over. Form a union! What an amazing read, this was quite hilarious, although I do quite feel for call center employees now that I think about it. It is rather unjust to impose on the a basic rights of others. Peharps they’re needs to always be an individual on standby, you know so that no calls are lost or anything but something, anything should be done so as to tactfully resolve such a dilemma? I mean to say disposable nappys? No way! I have worked several jobs where using the toilet was very low on a long list of priorities. As an employee, it’s very frustrating and disheartening, and it also reduces loyalty to one’s employer when you feel unvalued by them. oh my god, people being treated as children needing permission to go to the bathroom? oh my god! sorry to be the bearer of bad news my friends but I don’t need anyone’ permission to do anything, regardless, I just get up and go, if they harass I will get a lawyer and sue for harassment. this sounds more like a power play then actual need to avoid financial loss. oh yea I have called call centers before and I get put on hold, no problem I have a speaker phone can hear while I type or use the bathroom myself, I have diabetes insipidus so I go more than most (even with medication) and I refuse to allow others to dictate when I eat, go to the bathroom or take a break, if they want to deduct from my pay the amount deducted better darn well be exact and not excessive. by law your entitled to a fiften minute break every 4 hours I believe and a half hour lunch, i used to work at different jobs, this was standard. oh by the way funny story my hubby used to work at this factory, the job there was pretty easy the machines did most of the work, well my hubby was sitting reading and the guy next to him had to go to the bathroom, well the foreman said hold it until break, well he was so mad he peed in the trashcan. nice! Aw, how we all rush to grow up and be adults… just to be treated like children again. I’ve worked in call centers for over 6 years now, albeit in America. It’s interesting the difference as here a manager putting a note on a reps desk to say ‘no bathroom breaks on company time’ would be fired. Not that there is no emphasis on schedule adherence. It is there and looked at and you are ‘highly encouraged’ to be as compliant as possible. You can be fired for poor adherence too, at most companies, if not at least put on a final warning. But just taking a pee break here and there, they can’t say much of anything. Here’s hoping you all get the laws required for the same over there. Because that is all just crazy. I work in a call center in the US. We have a set amount of time we can have off the phone. 30 minutes total (2 15 minute breaks) for an 8 hour shift. That can be used for anything, bathroom breaks or smoking or what have you. You are highly encouraged to take all 15 minutes at once and some supervisors frown if you break up those breaks. But usually as long as you don’t go over the 30 minutes you are good. I can’t imagine there isn’t something that says employees can use the bathroom. Goodness, what happens if an employee suffers from a bladder condition or develops one due to the ridiculous rules around pee breaks. Wow. I have worked at a grocery store and a factory and have never had problems with being allowed a bathroom break. I have never worked in a call center though….now I never, ever want to…. I’d say “If you don’t like the fact that I have to use the bathroom, fire me!” I wouldn’t take that from any job NO MATTER HOW MUCH IT PAID!!! I loathe and despise working in call centres. It has certainly coloured my view of people! Ah, this makes timely and interesting reading! I have lately started at a callcentre, well it’s mostly very different indeed. But now I think this could be coming our way…prior to this we were allowed to read newspapers, do crosswords at desk, even eat at desk at times, wrap time was no huge priority, login times were checked only in so much as that we do so on time, nothing much else. But things are changing…smacks of becoming like a normal callcentre now in many ways. Yes – that’s the way it happens! The small freedoms go first – reading and websurfing during downtimes, then before you know it you’ll be getting memos about wrap times, toilet breaks and water-cooler visits. Like nearly all people who work in Call Centres, it was not part of my ‘master plan’ for my life, it was just one of those things that happened. And like most CS workers, I hated it, but worked my way up to middle management so that it would be more tolerable (not particularly because I wanted to be a manager, or even because of the better pay tbh). Eventually I managed to escape. But here’s the surprise. After a time of doing other ‘better’ jobs, I actually chose, voluntarily, to go back into the world of Call Centres, and back to being an Advisor too. The only differences are that I’m an Advisor with a lot of experience (in many cases far more experience than that of those that are ‘managing’ me), I’m a thirty something now when most of my peers are younger and far less worldy, but the most surprising difference is that I actually quite enjoy it now when I hated it before. That said, I am absolutely livid about a recent memo about going to the toilet during times other than our scheduled breaks. Whilst it didn’t say that it is not allowed, it did say that those that do go get their names on a daily report that goes to the big managers (reading between the lines, you get a bad reputation, and would therefore likely be ineligible for things like discretionary bonuses or promotions). The expectation it gave is that whilst one unscheduled toilet break might be OK once in a while, if you regularly have one unscheduled toilet break, i.e. you have another one a few days later, then that is considered unacceptable. It went on to cite examples of what type of ‘lavatorial emergency’ (their phrase) it would need to be in order for a resource (not person) to legitimately take one of those unscheduled toilet breaks. Needless to say, ‘because you feel like you need to pee’, isn’t on that list. I just cannot see how this is going to work. I’m not one for breaking the rules (boring, I know) but I don’t see how I can possibly commit to this (i.e. avoid going on ‘the big report’).